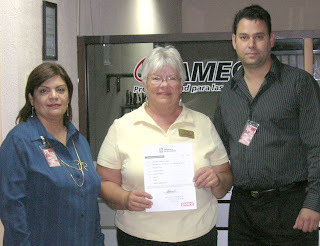 Gretchen Ellinger Receives State of Sonora Real Estate License from Minerva Zatairin and Edwin Beraud at the State Department of Economy in Hermosillo on 12 June 2008. Licensure for real estate agents is a reality in the state of Sonora, and a new era of real estate professionalism has evolved in Puerto Peñasco! When considering a real estate transaction, the most important choice for a prospective client may very well be selection of an agent to represent their needs. A few short years ago, northwest Mexico was the Wild West of real estate, with many transactions occurring with very little oversight, and widely varying qualities of professionalism and real estate expertise among salespeople. “Buyer beware!” was the mantra. There have been many changes since then! Most recently, the State of Sonora became the first state in Mexico to require Licensure for real estate salespeople. A 102-hour course, called the Diplomado, was brought to Puerto Peñasco by ISAP and CMIC (state governmental departments), with assistance from AMPI and PPAREA (national and local real estate organizations, respectively) from the state university in Hermosillo. Many real estate agents have taken the course, and a few have completed all the requirements and received their licenses. A requirement for licensure, in addition to background checks, fingerprinting, and much paperwork, the course provides a broad overview of real estate law, ethics, and practical application to real estate transactions in Mexico, which are quite different than in other countries, including the USA. The Diplomado, as well as the local Puerto Peñasco Association of Real Estate Agents (PPAREA) and the Puerto Peñasco chapter of AMPI, the Mexican national organization of real estate practitioners, and a thriving multiple listing service at their fingertips, afford real estate agents more opportunities than ever before to develop their skills and expertise. 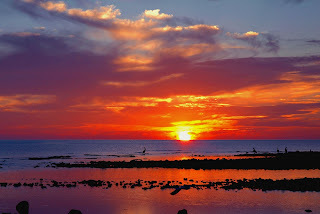 The result is that Puerto Peñasco clients, whether buyers or sellers, can choose from among many talented and qualified real estate practitioners. Choosing a Realtor with experience in the area of your need, education, membership in local organizations, and a license from the state of Sonora is an excellent place to start your real estate adventure. Some agents specialize in representing buyers or sellers, others are experts in certain areas of the locale, still others deal with only commercial or only residential properties. Some represent one development. All should be able to refer you to someone who can better help you, if your needs don’t fit their areas of expertise. Your well-chosen Realtor will successfully guide you through the process of your particular type of transaction, getting your Mexico adventure off to an excellent start. Gretchen Ellinger has lived and been a realtor in Cholla Bay for over 5 years. She is the Cholla Bay Manager for Century 21 Sun and Sand, and also operates Casa Monica Cholla Bay Bed & Breakfast. Contact her at gretchenellinger@century21penasco.com or 602-412-3311 (USA). It’s funny the turns life makes. Kathy Keane began hiking in her early twenties and became curious about the wonders of nature she saw along the trail. She took a class in bird identification and signed up for botany walks. Those left her wondering, as she gazed out the window of the medical office where she worked, whether she could get a job outdoors. She wrote to a wildlife biologist she had read about in National Wildlife magazine, and the author replied with some good advice. Kathy volunteered for the Forest Service and a local nature center and began her college education at age 25. She’d done well in high school biology but hadn’t taken much chemistry or math, so it was ten years before she earned her Master’s degree. In 1995, she started her own biological consulting business. She works with about 15 other biologists as subcontractors; they do surveys for utility and transportation projects, monitor protected nesting areas for endangered species, and oversee construction projects near wildlife habitat to ensure that the species aren’t harmed. The artist’s right brain wasn’t well developed as a child, and she was never encouraged or inspired to any art or music. She was a nerdy and shy kid, probably a precursor to the scientist she would become, she claims. 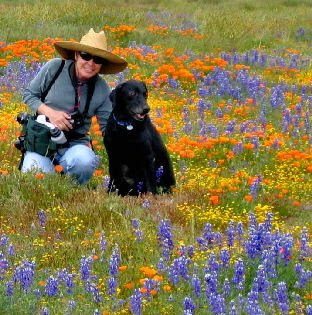 For over 20 years, in her leisure time, she organized and guided educational nature excursions into the southern California mountains, deserts, and coastal areas, and still participates in an annual Nature Knowledge Workshop. On her 50th birthday, she found and fell in love with San Felipe. There she learned how to sit and enjoy the beauty and wonder of nature; she was no longer compelled to identify and analyze every plant or creature around her. It was then, at San Felipe’s El Nido Restaurant, that she met Ruth Olivar-Millan, who paints incredible scenes and people of traditional Mexico. She showered Kathy with compliments about her work and encouraged her to join the San Felipe Fine Arts Association. Kathy says, “sometimes I’m lucky to be at the right place at just the right time, but generally I have to plan and wait for the perfect light, the precise pose of an animal, the ideal moment; still, I maybe use one out of 200 photos to enlarge and frame for an art show.” Before she switched to a digital camera, she explains, she would sit over the wastebasket when reviewing a box of 36 developed slides and was happy if there two were “keepers.” Digital photography allows her to see what she has captured on a screen, so it’s easier to correct mistakes right away and take another shot. Amigos Cantina - "The Friendliest Cantina In The Baja". We all remember that great television show Cheers…..Well, Baja has its very own version of the fun loving bar. The first time you visit Bahia Cantiles / Amigo's Cantina you will know what I mean. Owner Nicolas Santos has been service business for many years. Eleven years ago, he was tending bar at the then named Las Palmas in Puerto Nuevo, then he moved to a restaurant named Raul's and later he became the bartender at Cantiles, which he now owns. If you are looking for a quality drink at an affordable price in a very friendly atmosphere this is the bar. About ¼ mile north of the entrance to Puerto Nuevo and just behind "Virgins" at KM43, you will find this quaint and unique little restaurant and cantina Once you have experienced the hospitality, service and comradery you will return time and again. On the menu they have the finest Black Sea Bass in all of Baja, prepared in a variety of styles. Mondays is Men's Day and Wednesday is Ladies Day with special drink prices from 2-6. On the weekend live bands make for a great party environment. Take a chance on this hot tip and you won't regret it. You will discover why it is called "The Friendliest Cantina In The Baja". 1. Stretch your retirement income. Cost of living is quite low compared to most places in North America and a retiree can lead a very cost efficient lifestyle. The cost of hydro has risen considerably, but food, entertainment, property taxes and maintenance are very reasonable. The combination of low land and building costs make Mexico an affordable choice for retirement. 2. You’ll enjoy the fresh food choices. There is an immense variety of fish, meats, and fresh fruits and vegetables available at the local markets for reasonable prices. 3. Don’t worry about healthcare. Various types of insurance healthcare plans are widely available and there is a good selection of doctors, hospitals and medical specialists. 4. Enjoy the relaxed pace. Retirement is all about removing the stress from your life and taking time to relax. Mexico’s environment is far from fast paced, as a retiree you can be active, but still enjoy a low stress lifestyle. 5. Pick your climate. Decide what sort of climate you are most comfortable living in, depending on the area the weather ranges from year round spring-like weather to warm sea front locations and dry desert heat. 6. Mexico is big on sports. Most activities are available here, and whether you choose scuba diving or golfing, there is something for everyone. 7. Choose from a wide variety of locations. Whether you want city living, a secluded property surrounded by nature, or something in between, there are plenty of areas to choose from. 8. Select from a myriad of real estate opportunities There are properties available to suit every need including, apartments, resorts, condos and beach front homes. 9. Commonly used items are widely available. In order to accommodate the many foreign retirees, most foods purchased in Canada, the United States and Europe are available at many Mexican supermarkets. 10. You can keep up to date with the news back home. Cable and satellite are widely used, allowing you to continue viewing all the major US networks and global channels. Fishing was a way of life in Puerto Peñasco long before there was a tourist industry; in fact, fishing was necessary for most families to eat! Every man and woman I know who was raised in Peñasco can peel and de-vein a kilo of shrimp, and fry it to perfection in garlic oil, faster than you can look up how many pounds are in a kilo! A number of these talented cooks operate fine restaurants, and it wouldn’t be a trip to Puerto Peñasco without a great shrimp or fish dinner! 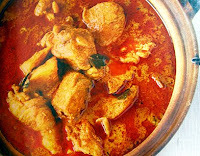 If you have not yet tried Aladino’s, you are in for a treat! Attractive with traditional Mexican decór, Aladino’s features a menu of Mexican entreés, at reasonable prices. Tortilla chips and salsa bandera, with cocktails from the full bar, started our meal. Our bilingual waiter patiently answered questions, but hedged on recommendations. “Well, I enjoy the camarón del Diablo, but you might not like something quite that spicy.” We did, and the less-spicy garlic shrimp was excellent, too. What? 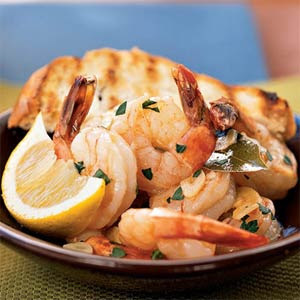 Everyone does not love shrimp? Those who love plain and simple fish will enjoy the pescado a la plancha, flounder broiled to perfection. All our meals were served with white rice, California-style mixed vegetables, and lots of hot tortillas. Very good flan, accompanied by freshly-brewed coffee, ended the meal perfectly. Cost? Under $20 each! Aladino’s, open from 7 a.m. until 11 p.m., is located on Avenida Constitución (Super Ley grocery is on the same street) 3 blocks north of Boulevard Benito Juarez (the main artery through town). Look for Hotel Paraiso, with the onion domes, on the west side of the street--Aladino’s shares the parking lot with the hotel. ¡Provecho! 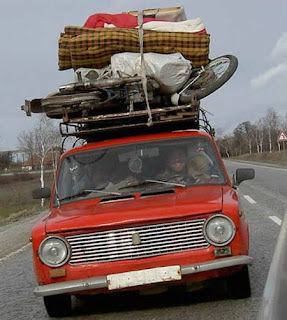 Many people move to Mexico to fulfill their dreams. They may be dreaming of a house near the ocean with warm temperatures and sea breezes. They may be dreaming of a quiet, slowly paced life, with time to enjoy simple things. They may enjoy water sports, fishing and snorkeling. They may long for a big, beautiful house that they can’t afford in the United States. They often fall in love with Mexico as visitors, and later decide they have found the perfect place to retire. Where in Mexico they choose to live depends on what they found there that they could not find in the United States. 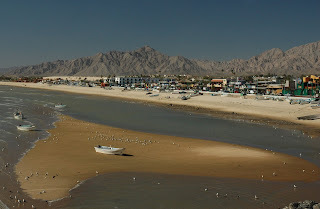 Many choose to go to Northwestern Mexico, to Rosarito Beach, Enseñada, San Felipe or Puerto Peñasco or San Felipe. 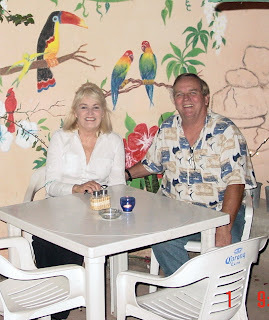 Cathy and Greg Tiwald visited Mexico many times as tourists. 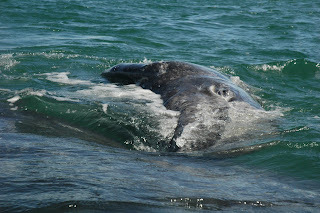 They love to scuba dive and had spent time in San Carlos, Enseñada and Puerto Peñasco. They looked into investing in Mexico but after visiting San Felipe, they decided they wanted to be residents, not visitors. San Felipe is a small fishing village which has shifted from dependence on fishing to tourism and real estate as its economic base. In 2005, about 15,000 people lived in San Felipe, many of whom were American or Canadian. Greg says that the couple regularly visited Mexico to scuba dive. When they saw an advertisement for an opportunity to own property in Mexico, they decided to buy with the intent of retiring in Mexico. Diane Pavellas also was looking for the right place to retire, and eventually picked Rosarito Beach, which is located 20 minutes from the border crossing at Tijuana, almost commuting distance to San Diego. About 85,000 people live in Rosarito, including some 25,000 Americans. She did not know that there was a way Americans could buy land near the ocean in Mexico. She was thinking of San Diego and all its amenities when she decided to take a look at Mexico. She told her cousins, Tom and Dee Thomas. They decided to join Diane as she looked for the right place. She says, “This was my first trip to Mexico in 20 years. I relied on my cousins’ opinions and the information I received from the Internet and books. Unfortunately she had a few problems before she found her perfect place. The realtors initially seemed unable to find her a one-story house with two baths and bedrooms, one for her and one for her 88-year-old mother. Eventually, however, they did; and she found her dream home. Her cousins bought the house next door. Sadly, her mother had a stroke and could not live in this new home; but Diane made other arrangements for her and eventually moved to Rosarito. Bernadette Schmuker lives about 40 miles south of Rosarito in Enseñada, which is popular with both tourists and people looking for a place to live in Mexico. About 38,000 of its 220,000 residents are from the United States or Canada. Originally from Michigan, she was a foreign exchange student through Rotary International, and spent a year in Sonora. She returned home to Michigan, but felt that she had to return to Mexico. 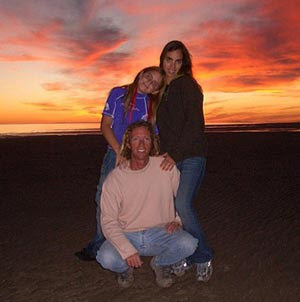 Roland and Tammy Mondragon also followed their dreams and moved to Mexico, to Puerto Peñasco. They were living in Las Vegas, caught up in the corporate “rat race.” They thought it would be best for them to escape the stress. The Mondragons did not buy a house, but they opened a business called Kayak Rocky Point. Tammy and Roland left behind children and grandchildren in Las Vegas, and they do miss their family. E-mail and internet phone services such as Vonage, and magicJack however, facilitate frequent communication. The family visited for Thanksgiving, and plan to make it an annual event.